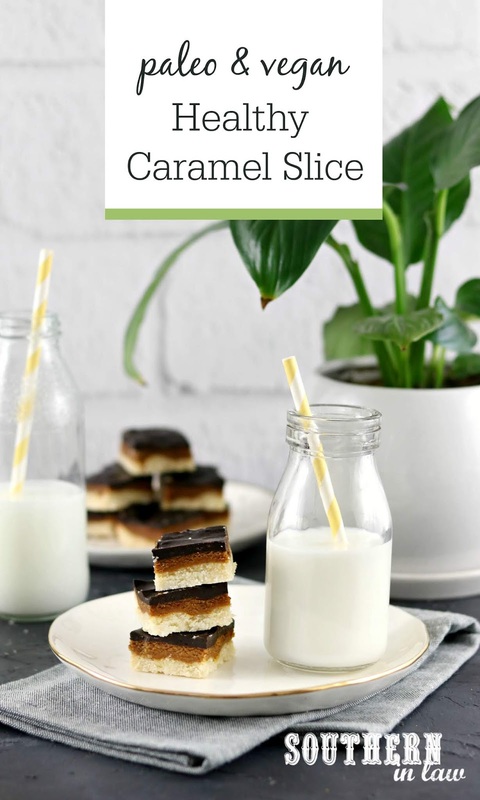 This Healthy Caramel Slice Recipe is paleo, vegan, grain free, refined sugar free and SERIOUSLY delicious! 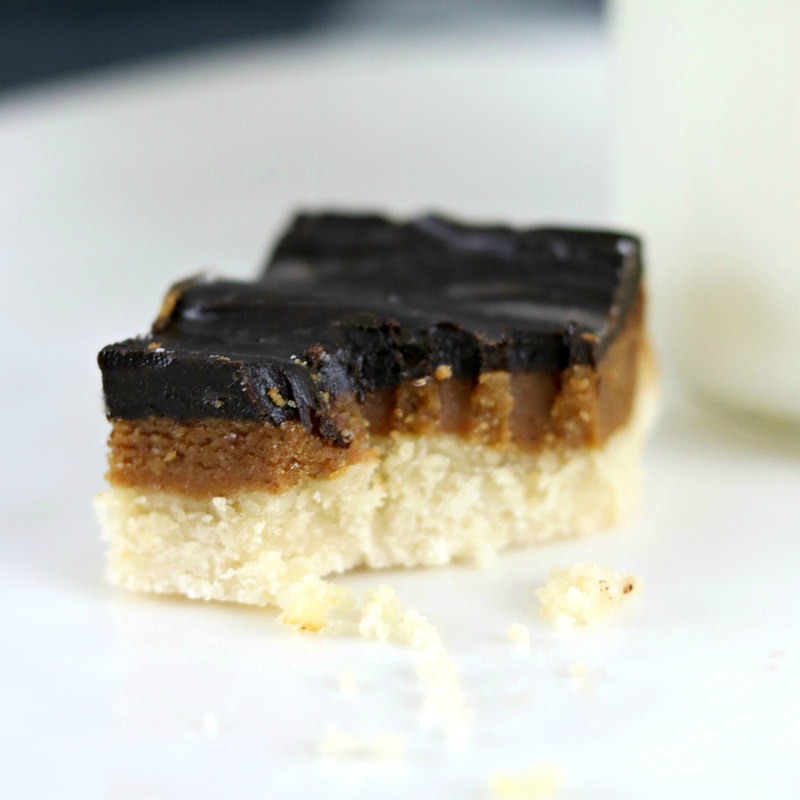 Made with almond butter (or your favourite nut butter), it features a coconut flour biscuit base with a gooey maple syrup caramel filling and healthy chocolate topping. One of the best healthy dessert recipes that you need to try ASAP! Simple, easy and so delicious! Click to pin this recipe on Pinterest! I'll be totally honest, this wasn't the recipe I planned on posting today. In my head, I had big dreams of a delicious Easter recipe - but then life happened and after a crazy busy week of work, and a weekend of madly cooking for Jesse's birthday party, I just didn't have the time (or energy) to make it. But it's okay... because if I was going to give you a consolation prize, this would be the most delicious one I could come up with. You see, this Caramel Slice Recipe was one I was saving for after Easter, but it's one you really shouldn't have to wait for. Not only is it gluten free, it's refined sugar free, vegan and paleo - so everyone can enjoy it. When I first came up with this recipe, I thought it might have been one of those treats I could keep to myself - because Jesse isn't a rich/dark chocolate fan. But oh was I mistaken. I let him try a tiny piece (because I wasn't going to waste my deliciousness on him if he hated it - ha!) - and before I knew it, he was making claims on the rest of the container. Not cool. It quickly became a favourite of not only Jesse and I, but our family and friends too - so I knew it was a recipe I had to share. 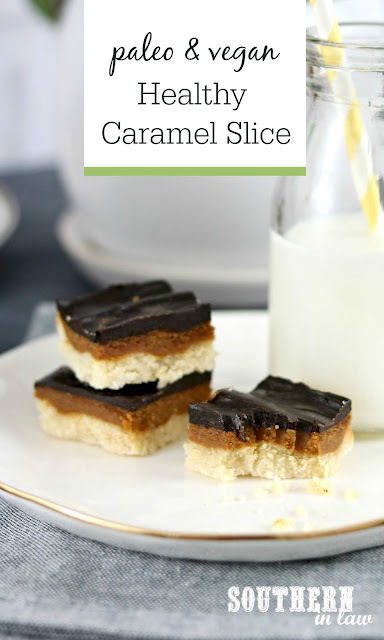 Unlike traditional caramel slices, this isn't the kind of treat that leaves you with a sugar hangover. It's just sweet enough and better for you, whilst still feeling seriously decadent. Click to pin this post on Pinterest! Line an 8x8" baking tin with baking paper and set aside. In a bowl, combine all of your base ingredients and then press your base mixture into the bottom of your prepared tin, spreading it down to form an even layer and pressing it down firmly. Bake your base for 9-11 minutes or until lightly golden and leave to cool. Whilst your base is cooling, add all of your caramel ingredients to a small saucepan and heat over a medium-high heat until all of your ingredients have melted and the mixture begins to bubble. Continue stirring until your mix starts to thicken and then remove it from the heat. Pour your caramel mixture over the top of your cooked base (don't worry if it's not totally cool!). Spread your caramel layer out evenly and chill your caramel topped slice in the fridge for an hour (or in the freezer for 10-20 mins). Once your caramel layer has set, prepare your topping by melting the coconut oil with your maple syrup, then stirring in your salt and cocoa powder. Pour your chocolate topping over your caramel layer, spreading it out to form an even layer. (If it seizes and becomes thick, don't worry! It will still work out!). Chill in the fridge until firm and then slice into pieces. *You can also use cashew butter or peanut butter instead of almond butter here! Instead of the chocolate topping, you can top your slice with melted chocolate if you don't want it to be paleo/vegan/sugar free (or use a chocolate that ticks all of those boxes!). What's your favourite kind of chocolate? Milk? White? As dark as possible?